For the architectural style in the United States, see Queen Anne style architecture in the United States. For furniture design, see Queen Anne style furniture. The Queen Anne style in Britain refers to either the English Baroque architectural style approximately of the reign of Queen Anne (reigned 1702–1714), or a revived form that was popular in the last quarter of the 19th century and the early decades of the 20th century (when it is also known as Queen Anne revival). 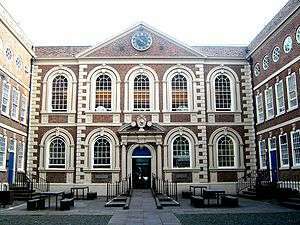 In British architecture the term is mostly used of domestic buildings up to the size of a manor house, and usually designed elegantly but simply by local builders or architects, rather than the grand palaces of noble magnates. When used of revived "Queen Anne style" of the 19th and 20th century the historic reference in the name should not be taken too literally, as buildings in the Queen Anne style often bear as little resemblance to English buildings of the 18th century as those of any revival style to the original. Furthermore, the Queen Anne style in other parts of the English-speaking world, particularly in the United States and Australia, is significantly different from that in the United Kingdom, and may hardly include any elements typical of the actual architecture of Anne's reign. Shaw's eclectic designs often included Tudor elements, and this "Old English" style also became popular in the United States, where it became known (inaccurately) as the Queen Anne style. Confusion between buildings constructed during the reign of Queen Anne and the "Queen Anne" Style still persists, especially in England. 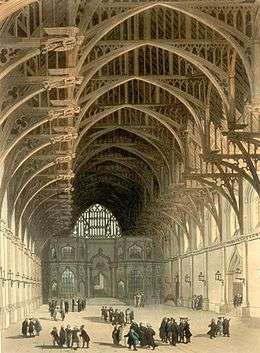 When an open architectural competition took place in 1892 for a county hall to be built in Wakefield, in the West Riding of Yorkshire, the instructions to competitors noted that "the style of architecture will be left to the competitors but the Queen Anne or Renaissance School of Architecture appears suited to an old town like Wakefield". The executed design, by architects James Gibson and Samuel Russell of London, combines a corner turret, grandly domed and with gargoyles at the angles, freely combined with Flemish Renaissance stepped gables. In the 20th century Edwin Lutyens and others used an elegant version of the style, usually with red-brick walls contrasting with pale stone details. In the United States, the so-called "Queen Anne style" is loosely used of a wide range of picturesque buildings with "free Renaissance" (non-Gothic Revival) details rather than of a specific formulaic style in its own right. "Queen Anne", as an alternative both to the French-derived Second Empire and the less "domestic" Beaux-Arts architecture, is broadly applied to architecture, furniture and decorative arts of the period 1880 to 1910; some "Queen Anne" architectural elements, such as the wraparound front porch, continued to be found into the 1920s. 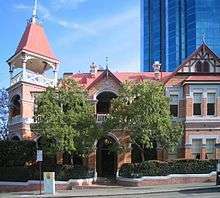 In Australia, the Queen Anne style was absorbed into the Federation style, which was, broadly speaking, the Australian equivalent of the Edwardian style, derived from the influence of Richard Norman Shaw, an influential British architect of the late Victorian era. The Federation period went from 1890 to 1915 and included twelve styles, one of which was the Federation Queen Anne. This became the most popular style for houses built between 1890 and 1910. The style often utilised Tudor-style woodwork and elaborate fretwork that replaced the Victorian taste for wrought iron. Verandahs were usually a feature, as were the image of the rising sun and Australian wildlife; plus circular windows, turrets and towers with conical or pyramid-shaped roofs. 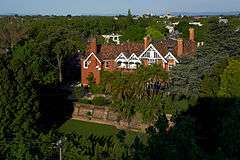 The first Queen Anne house in Australia was Caerleon in the suburb of Bellevue Hill, New South Wales. Caerleon was designed initially by a Sydney architect, Harry Kent, but was then substantially reworked in London by Maurice Adams. This led to some controversy over who deserved the credit. The house was built in 1885 and was the precursor for the Federation Queen Anne house that were to become so popular. 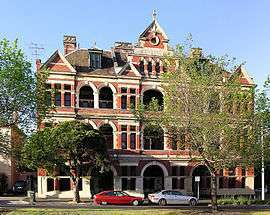 Caerleon was followed soon after by West Maling, in the suburb of Penshurst, New South Wales, and Annesbury, in the suburb of Ashfield, New South Wales, both built circa 1888. These houses, although built around the same time, had distinct styles, West Maling displaying a strong Tudor influence that was not present in Annesbury. The style soon became increasingly popular, appealing predominantly to reasonably well-off people with an "Establishment" leaning. 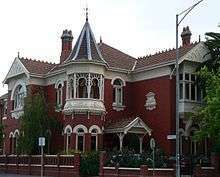 The style as it developed in Australia was highly eclectic, blending Queen Anne elements with various Australian influences. 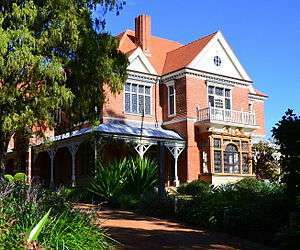 Old English characteristics like ribbed chimneys and gabled roofs were combined with Australian elements like encircling verandahs, designed to keep the sun out. One outstanding example of this eclectic approach is Urrbrae House, in the Adelaide suburb of Urrbrae, South Australia, part of the Waite Institute. 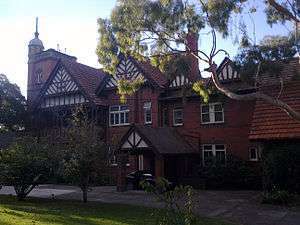 Another variation with connections to the Federation Queen Anne style was the Federation Bungalow, featuring prominent verandahs. This style generally incorporated familiar Queen Anne elements, but usually in simplified form. Girouard, Mark, Sweetness and Light: The Queen Anne Movement, 1860–1900, Yale University Press, 1984. The primary survey of the movement. Macquoid, Percy, Age of Walnut, 1904. The Shingle Style and the Stick Style: Architectural Theory and Design from Downing to the Origins of Wright, revised edition, Yale University Press, 1971. Rifkind, Carole. A Field Guide to American Architecture. Penguin Books, New York, 1980. Whiffen, Marcus. American Architecture Since 1780, MIT Press, Cambridge, Massachusetts, 1999. ↑ The Times, "Bricks and Mortar" Supplement, 5 May 2006, pp.6-7.